Now for the Design Story Breakdown. The color palette for this soon-to-be contemporary little bedroom will be tan tones layered with creams, chocolates and greens. The walls will be adorned in a nice rich taupe color (try Sherwin Williams Diverse Beige 6079). The trim will look soft in a light ivory shade (use Sherwin Williams Dover White 6385). Since the all of walls will be in the tan color, I’ll add a bundle of personality by layering in the greens and other similar hues to keep things interesting, yet classical. The key to adding interest and personality to a sparse space is the right mix of textures and accessories to keep the eye moving around the room. This great sculptural accent (only $29.99) would look gorgeous over the bed to add more height and structure to the space. Here’s the soft and sleek upholstered king-sized bed that we chose for the space. 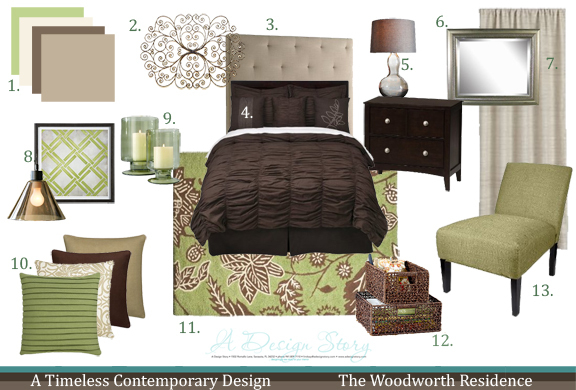 It’ll look streamlined and contemporary and will link the other furniture pieces in with the theme. Candice mentioned that she would love a darker fabric for the bedding for maintenance and overall durability (as she has three kids). This gorgeous & luxurious bedding that I selected for the bed boasts the darker hue without being boring. It has shape and texture that will add to the overall elegance in the room. I would love to see one of these mirrors hung on either side of the bed right above each bedside table to reflect light from the lamps and add shimmer to the walls! Little tricks like that truly enhance the space and make it sparkle! Side note, this mirror just happens to be on sale! These luxe natural curtains will look classic and elegant hanging high above each window for even more balance and style. Since your ceiling isn’t real tall, I suggest mounting them about an inch or two below your ceiling which will make your windows look taller and visually brighter! Here are the chic little accessories that we’d love to see in the “reading zone” (in the corner with the fabulous green chair). This classic, glass pendant will look stunning hung right above the chair for extra lighting. Hanging right above the chair, this modern lithograph print will add in an extra pop of green and interest to the space. Soft patterns and textures are the name of the game in here since they’ll embellish things up the room without making it feel too trendy or loud. I would love to see this combination of pillows (here’s one, two, three, and four) tossed onto the bed for layered & mixed look that exudes comfort! I really like to add rugs in the bedroom (even when the space has wall to wall carpeting) just to bring texture, color, pattern, and interest to the center of the room, which will instantly feel more grounded and welcoming. This green floral, vintage rug will go great for a splash of fresh green underfoot! For added storage, try utilizing these collapsible woven baskets on your excising dresser and countertops. Baskets are great to create a more organized space by hiding clutter and odds and ends. I instantly fell for this spunky green chair because I knew it would look so fresh and crisp paired with the tan and the brown tones that we’d be bringing in. Incorporating a lounge chair in a larger bedroom creates a comfortable and inviting reading (& relaxation) zone. As for where it’ll go, I would actually like to see it to the left of the sliding glass doors in the corner (in place of baby’s crib when she moves onto her new room). And really try and keep it as organized as possible! So there you have it. A timeless, contemporary bedroom full of soft and classical style. I can’t wait to see what you guys think! And if you are in need of a custom room renovation, click here to purchase your design package and let us design a new story for your interior! Stay tuned… we are going to be showing a Back Porch Reveal, a Front Porch Reveal and some DIY Projects soon!